For a wounded man shall say to his assailant, if I die, you are forgiven. If I live, I will kill you. Such is the rule of honor. United we stand, divided we fall. Heavy focus on PVP, and PVE oriented tasks, feel free to ask as many questions as you like in here. No question is a dumb question. 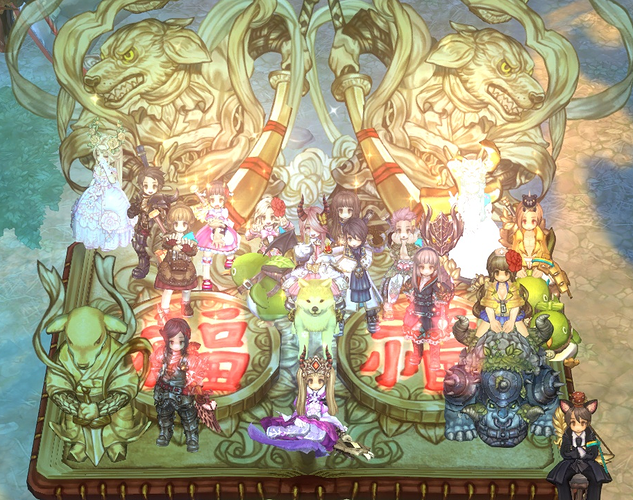 Boss albums summoning events every Sunday, EVERYNIGHT we do guild missions and have around 20-40 members on for raids as well. You are granted atleast 100 boss/enhancement cards a week for participating. 18+ preferably, adults only here. We have dirty mouths. All in good fun. If you are the type to socialize feel free to join us, we have plenty to talk about. Help with dungeons is a staple of the guild, we all hope to have enough active members to help all our up and comers. We got nothing against nobody, unless you got something against us. Our guild philosophy can be summed in a few words, LOYALTY / SERVITUDE / GREATNESS / LIBERTY and love of demon-slaying. MANDATORY ACTIVITY - Plain and simple. If you can’t make the time, let me know personally or a guild officer whom will eventually deliver the message to me. This is a flexible rule. Just be as active as you can be, let me know how often you are on and we can work around it. Don’t feel discouraged by this rule. MANDATORY DISCORD DURING PLAY - I understand some of you may be less inclined to speak using your voice, we do not ask you speak if you do not want to however we do ask you to be present in the Discord as it improves guild cohesion and communication. NO DRAMA/ELITISM like you find in other guilds, the guild leader IS NOT ALWAYS RIGHT, contrary to other guilds that seem to exist to pad the ego of the leader. This guild is a huge break-away from this. We cherish all our members and want to see you succeed wherever you focus yourself. Help us help you. HELP OTHERS IF DOING NOTHING - I ask our officers for feedback on whom has been very helpful to the new ones, and also ask the new ones directly to see whom deserves praise. If I catch you helping someone I may not say something, but I see everything and I keep note. You WILL be given restitution for your sacrifice to your fellow comrades. Even if you don’t know the answer to something and you see a guildie asking over guild-chat, address the guildy let them know you don’t know or maybe suggest ways to find out how to get the information required. Silence can be defeaning sometimes to a new player, this game is already frustrating as is, let’s not make it even worse. YOU REPRESENT THE GUILD so don’t do anything the guild wouldn’t like to be represented by. Post to this topic or message Typhoon / Typhoonz in-game, if I’m not busy you can ask to be interviewed, recommended to leave both a post on here and message me ingame for better visibility. Inbox tends to get swamped. Thank you for your interest. HELP OTHERS IF DOING NOTHING - Every month along with the raffle, I ask our officers for feedback on whom has been very helpful to the new ones, and also ask the new ones directly to see whom deserves praise. If I catch you helping someone I may not say something, but I see everything and I keep note. You WILL be given restitution for your sacrifice to your fellow comrades. Even if you don’t know the answer to something and you see a guildie asking over guild-chat, address the guildy let them know you don’t know or maybe suggest ways to find out how to get the information required. Silence can be defeaning sometimes to a new player, this game is already frustrating as is, let’s not make it even worse. 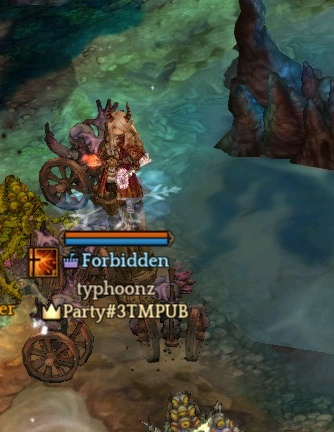 It’s been a very long time that I didn’t see a guild using this system, that way you know which players NEVER help and or NEVER participate in anything. bump, All orshans are welcome. Hi, fairly new player here. All of the #1 tips for new players seems to be to sign on with a guild, so here I am. 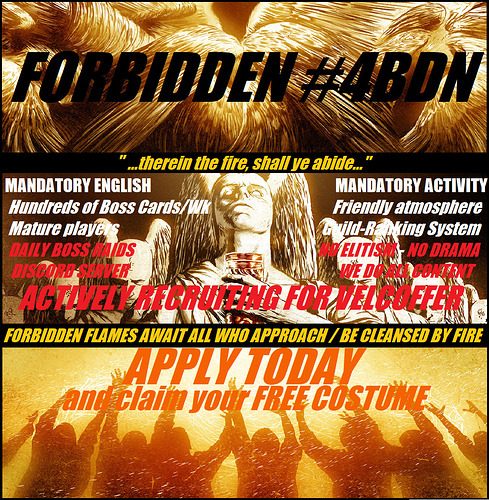 Forbidden seems to be exactly what I am looking for. Team name is Ironfang ig. Let me know if there is any other info you need from me. I look forward to your reply! Hi! I’m not sure if you guys are still recruiting, as it’s been a while since anyways posted to this topic. I’m very interested in your guild nonetheless! I’m a fairly new player, currently lvl182 (Wiz 2, Linker 2, Sorc 2). My team name is Nivera and my current (and only character) ign is Alvis. I’ll try messaging Typhoon / Typhoonz as well, for visibility (and desperation). 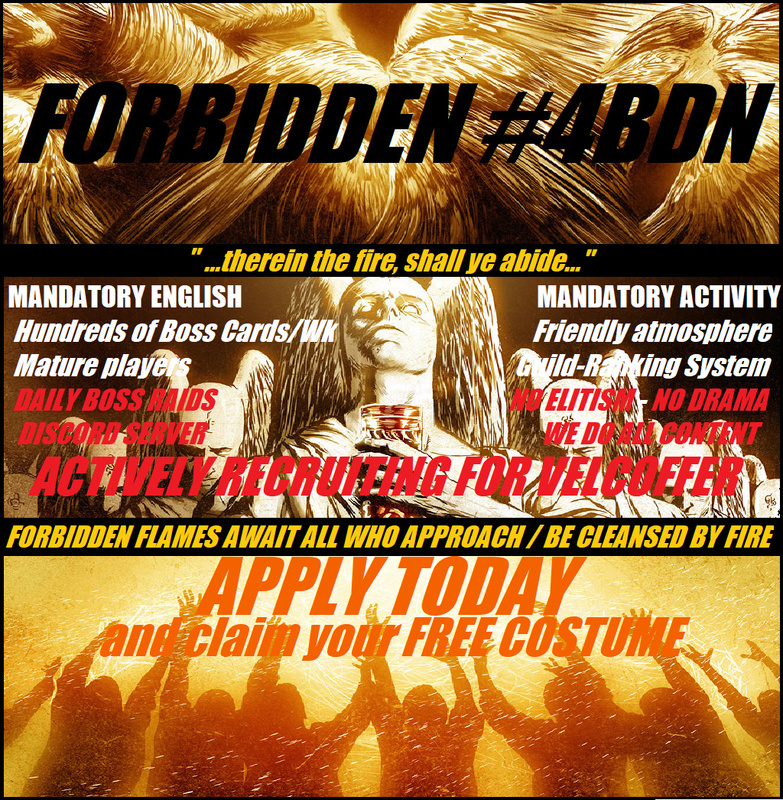 † Join Our Crusade † Forbidden Recruitment is now Open (PVPers Preferred)† Mandatory Activity Required † Mandatory English Speaking † GuildDiscord / GuildRanking / Guild Raids / Guild Missions † ALT+R to apply (Find our Banner) or PST! Heya all, just dropped my submission. Hope to join you all soon!